169 other birds have this item in their bag or wishlist! Give your office style a modern edginess for autumn with the Belle Leatherette Jacket from Belle bird. I was surprised how flattering this jacket is. Good colour too. I'll be wearing this to work a lot this winter. Oh this jacket is nice. It can be dressed up or down. I have rather large shoulders but this jacket has some stretch to it. True to sizing also. I was unsure about this item as it’s outside of my comfort zone. I knew I’d made the right choice when my husband said I looked like I’d stepped out of a dystopian sci-fi movie (exactly the effect I wanted - perfect for the next boring committee meeting!). The ‘leatherette’ material wasn’t what I expected. Hard to see in the pictures that it’s textured. Feels very plastic, but I don’t mind that. If you’re a courageous dresser, you’ll like it. If you’re looking for a conservative blazer, I’d give it a miss..
Well I feel like a million bucks in this gorgeous 'leather like' jacket. 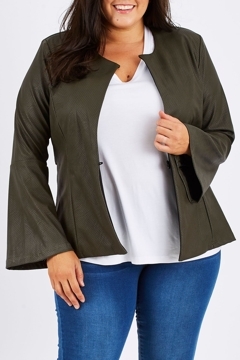 It has a smooooth feel and glamorous sleeves which compliments this designer style jacket! The shoulder pads corrects my rounded shoulders, while the collar is cut beautifully to create a smart look. The only down side is that it quite short, so if you have a round belly like me...spanks work a treat! Otherwise, I have received many compliments on the cut and design. Loved it! Very flattering and I wore it with the matching skirt. It also gives you a slimmer look.